The adjacent chart shows price movement of MCX Aluminium. 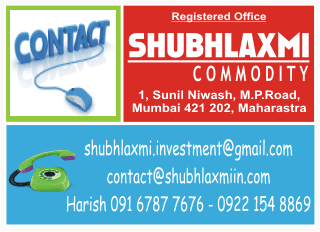 MCX Aluminium has been trading in a mediumterm downward sloping channel. Recently, from the lower channel line, the base metal has moved up significantly. It reached 78.6% retracement mark. From there the metal has entered a correction mode. It has formed first leg of the fall and has done a three-wave pullback. The upper end of the pullback channel is acting as a strong resistance. Thus, the pullback looks complete at 110.25. Unless that is crossed on a closing basis, the base metal is expected to resume with the larger downtrend. The key supports are 106.5 and 106, whereas the overall short-term target on the downside is at 101.30, ie equality target.